Although tee ball games are fun for both players and coaches, baseball skill development during practices is just as important, if not more important than winning games. As a tee ball coach, you should conduct age-appropriate and engaging drills during each practice session to teach your players the fundamentals of the game, including batting, catching, fielding, running the bases and throwing. Tee ball players often have trouble standing the same way in the batter's box every time and keeping their balance when they swing. The box hitting drill teaches these skills. Mark a rectangular box on the ground near home plate, about 3 feet long by 1 foot wide. Have one player at a time practice 10 swings from inside the box. After each player takes his turn, have him hit 10 balls off a tee from inside the box. If he doesn't stay inside the box, teach him a different stance so his swings are consistent. 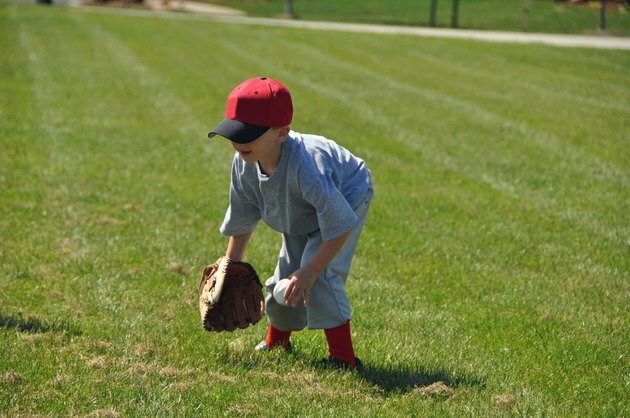 Catching and throwing are two of the most basic skills tee ball players need to learn. Before starting the catch and throw drill, teach them how to catch the ball above their waist with their fingers pointed up and below their waist with their fingers down. Have a group of players form a line and stand about 5 yards in front of the first player with a ball. Cycle through the line several times, tossing the ball underhanded either above or below the waist, and having the player catch the ball properly, take it out of his glove quickly, and throw it back to you. Provide encouragement and feedback to each player during the drill. The chair drill teaches tee ball players to field ground balls from the correct position. Have a group of players line-up next to a small chair. Tell one player at a time to sit on the chair with his feet wider than shoulder-width and flat on the ground. Teach him to lean forward while keeping his spine straight, place his glove on the ground in front of himself with his palm facing forward and slightly upward, and position his throwing hand directly above his glove, ready to take the ball out. Explain to the players that this is the proper ground ball fielding position, even without the chair. Roll several ground balls to each player while he sits in the chair and then remove it for several more repetitions. The towel drill allows tee ball players to practice throwing mechanics without worrying about where the ball goes. Use this drill before the catch and throw drill. Give each player a small towel and have him hold one end in his throwing hand. Teach the player to start facing forward, step forward with his arm-side foot, turn his body toward his arm-side, raise his arm to make a letter "T" shape, step forward with his glove-side foot, and pretend to throw the ball by snapping the towel in front of himself. Direct each player through 10 to 20 repetitions. Coaching Baseball Successfully; Andy Lopez, et al.